With a full week of Big Ten basketball already under our belts, let’s assess some of the strongest first impressions from around the league — for better or worse. It’s not a “hot take” to suggest Purdue can win the league. Michigan State was the unanimous pick to win the Big Ten this season, and for good reason — the Spartans are loaded, and Miles Bridges might be the best player in college hoops. But Purdue is also very good, and early returns suggest it may have been seriously undervalued in the preseason polls. After scoring 1.38 and 1.42 points per possessions against SIU-Edwardsville and Chicago State, respectively, last week, the Boilermakers handled Marquette in Milwaukee on Wednesday night, 86-71, as part of the Gavitt Tip-Off Games. The most impressive aspect of the win wasn’t so much the 15-point margin as it was Purdue’s ability to shrug off the Golden Eagles’ patented three-point surges, time and again answering the home team’s offensive spurts with flawless execution of its own. 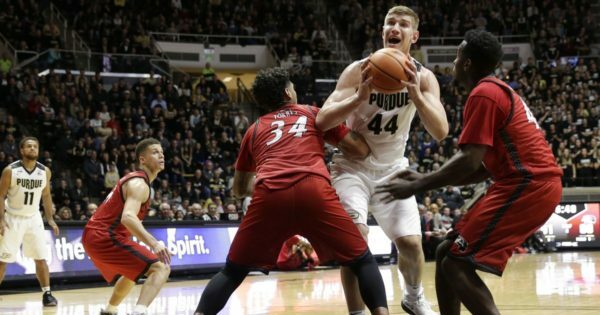 Matt Painter’s group was especially great in the half-court, working much of its offense through center Isaac Haas; the senior finished with 22 points in 20 minutes, using a whopping 44 percent of the possessions while he was on the floor. What’s more, the emergence of 7’3″ Dutch freshman Matt Haarms — who is averaging 19 minutes, nine points, and nearly three blocks per game — suggest that Painter has someone who can consistently (and productively) spell Haas when he sits. The scariest part? Purdue’s usually-excellent three-point shooting was lackluster against Marquette (4-of-12 3FG). Instead, the Boilers thrived on key defensive stops (like this Carsen Edwards’ chase-down block) and outstanding interior ball movement. On nights when Vincent Edwards, Carsen Edwards, Dakota Mathias and PJ Thompson make it rain from the perimeter — like they did in the team’s first two games (combined 19-of-36 3FG) — Purdue will be nearly impossible to beat. Experienced, balanced, and offensively dominant when Haas plays like he did on Wednesday, Purdue has all the pieces to compete neck and neck with Michigan State in the Big Ten this season. Anthony Cowan Jr. looks like the man in College Park. Melo Trimble’s impact will never be forgotten at Maryland, but Anthony Cowan Jr. is certainly doing his best make sure Terps’ fans don’t dwell in the past. Through three games, the sophomore is averaging 18.7 points, 8.3 rebounds, 3.0 assists, and 1.7 steals per night, including a dynamic performance against Butler on Wednesday night. Cowan did seemingly everything in the win, scoring 25 points on 12-of-15 shooting, dishing out five assists, and coming up with Russell Westbrook-esque rebound after Russell Westbrook-esque rebound in the game’s closing minutes. With Kevin Huerter (10.7 PPG) and preseason all-Big Ten pick Justin Jackson also at his disposal, head coach Mark Turgeon doesn’t need to worry about finding a do-it-all replacement for Trimble. And yet — if the first few games are any indication — he may have found one anyway. Jordan Murphy is taking Minnesota’s offense to new heights. 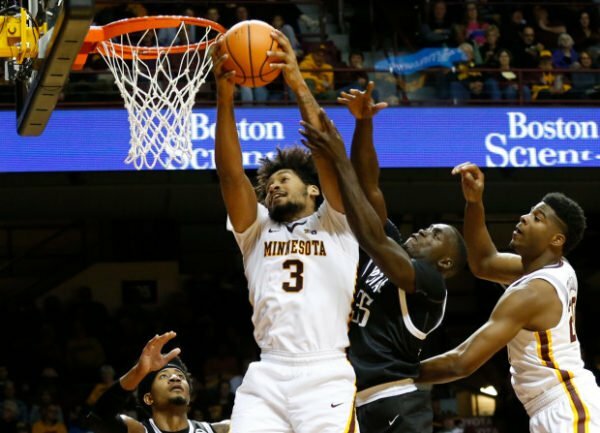 Minnesota’s calling card last season was its defense, which held Big Ten opponents to a conference-low 46.5 percent effective field goal percentage. The offense, while much improved from 2015-16, was middling. Through three games this year, though, the Gophers have been outright dominant on that end of the floor, scoring over 1.12 points per possession, including a 1.16 PPP effort in their road victory at Providence on Monday. The most obvious explanation for the uptick in production? Power forward Jordan Murphy and his monstrous performances. After averaging 11 points and eight rebounds as a freshman and sophomore, the Texas native is off to a brilliant start this season, using his strength and quickness to run circles around opposing big men. Through one week, Murphy is averaging 25.3 points and 13.3 rebounds per contest, looking less like a secondary option to Nate Mason or Amir Coffey and more like the focal point. Even if (or when) his numbers come back to earth, Murphy’s emergence should give Minnesota fans reason to believe this team can match — or even exceed — its preseason hype. Indiana has a long way to go. Entering the year, Indiana hadn’t given up more than 1.20 points per possession against a regular season non-Big Ten opponent since being walloped by Duke in the 2015 ACC/Big Ten Challenge. One week into the season, the Hoosiers have already conceded more than 1.20 PPP twice, including an embarrassing 90-69 home loss to Indiana State on opening night. Archie Miller preached defense during the summer, and it’s the one area where Indiana fans expected to see clear improvement this season. And while they still might, early struggles against the Sycamores, Seton Hall and Howard suggest it might take more than a few ugly results — and perhaps an ugly record — before Miller’s groundwork takes hold. This entry was posted on Friday, November 17th, 2017 at 12:31 pm by Tommy Lemoine	and is filed under big ten, feature, microsites. Tagged: Anthony Cowan, archie miller, big ten, indiana, isaac haas, Jordan Murphy, mark turgeon, minnesota, purdue, richard pitino. You can follow any responses to this entry through the RSS 2.0 feed. You can leave a response, or trackback from your own site. Minnesota looks like they’re for real and Jordan Murphy is a beast. Could give Bridges a run for B1G POY if he can keep up his work so far, though there is a LONG way to go. Watched IU against SHU and yeah, they are trash.